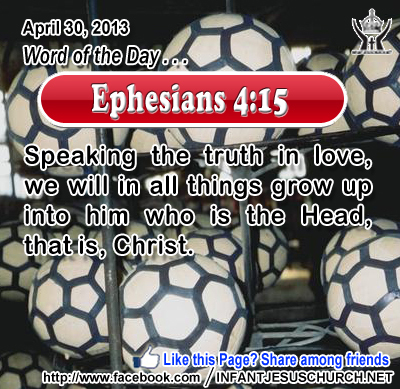 Ephesians 4:15: Speaking the truth in love, we will in all things grow up into him who is the Head, that is, Christ. Heavenly Father, forgive us for the bitterness in our heart and unfairness on our lips. Through your Spirit, help us better use our speech to bless others and glorify you. May we speak your truth with your love today in all our conversations. Through him who is Truth and Love we pray. Amen. 27Peace I leave with you; my peace I give to you; not as the world gives do I give to you. Let not your hearts be troubled, neither let them be afraid. 28 You heard me say to you, `I go away, and I will come to you.' If you loved me, you would have rejoiced, because I go to the Father; for the Father is greater than I. 29 And now I have told you before it takes place, so that when it does take place, you may believe. 30 I will no longer talk much with you, for the ruler of this world is coming. He has no power over me; 31 but I do as the Father has commanded me, so that the world may know that I love the Father. Rise, let us go hence. .
Nobody can take us from the peace and joy of Jesus. No distress or grief, no danger, no suffering can make it less. Jesus also speaks of his destination and final triumph over the powers of evil in the world. In the eyes of the world the cross stood for shame, humiliation, and defeat. Jesus went to the cross meaningful that it would lead to victory over the powers of sin and of Satan. Jesus also knew that he would come back to his Father in glory. The cross brought glory to Jesus and to the Father and it is our way to glory as well. In the Cross of Christ we find true peace and reunion with God. Do you live in the peace of Jesus Christ? Loving Infant Jesus, may your peace be always with us. May no circumstance, trouble, or vexation rob su of the peace which passes all understanding. You, alone, O Lord, are our Peace. May we always reside in that peace by believing your word and by doing your will.